Along with hair and nails, skin is the fastest growing and most superficial tissue in the body. As such. it has a high demand for nutrients in order to continually replenish itself with rapidly developing cells from the layers below. Adeeva™ Nutritional Supplements feed the lower levels of the skin with nutrients from the bloodstream to support healthy skin formation. Antioxidants protect against UV light damage and premature agin. B Vitamins help form normal, healthy skin cells. Other nutrients – help skin cells develop into mature adult cells and alleviate skin conditions such as eczema and acne. Orega-Sept contains research tested P73 wild oregano blend that has been tested for its ability to kill a variety of common microorganisms associated with infections, candida, gastric ulcers, acne and rosacea. Orega Sept is referred to as nature’s antibiotic but unlike pharmaceuticals , it does not produce antibiotic resistance or other associated side effects. Take a high potency multivitamin and mineral that contains the dosages of anti-oxidants and B-vitamins required for healthy skin….. Adeeva™ Multi-vitamins support the skin, slow the aging process and include bone-support. 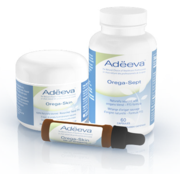 Adeeva™ Natures Essential Oils – nutritional supplementation containing borage, flaxseed and fish oil daily – the perfect blend of omega 3,6,9 essential fatty acids. Derived from pesticide & mercury free sources, this combination supports skin smoothness and softness in addition to cardiovascular, brain and nerve function. Adeeva™ Flora Essentials – A full complement digestive enzyme along with prebiotics. Many skin inflammatory conditions are aggravated by partially digested food matter entering the circulation and triggering an immune-inflammatory reaction. Prebiotics support the growth of friendly gut bacteria, which have been shown to suppress inflammation in a variety of skin conditions, including acne. In addition to supplementation, we suggest dietary choices that include more fish, chicken turkey and soy products in place of high fat meat and dairy. Switch to the use of olive oil, avocado oil and peanut oil instead of corn, sunflower, safflower and mixed vegetable oils.